Baseball is fondly referred to as America’s past time. The sport has a history in the US that stretches back over 120 years, making it the nation’s oldest organized professional sports entity. In 2014, the US Mint celebrated the game’s history with the release of its first ever curved coins on the 2014 $1 Silver Baseball Hall of Fame series. 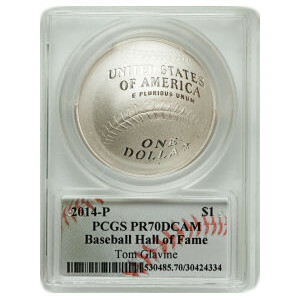 Today, you can purchase a 2014 $1 Silver Baseball Hall of Fame coin PCGS PR70 DCAM, from Silver.com with a Tom Glavine label. Thomas Michael Glavine was a left-handed pitcher for the Atlanta Braves and New York Mets. He was inducted in Major League Baseball’s Hall of Fame in 2014. Glavine collected 305 victories as a starting pitcher, and is just one of two left-handed pitchers to have eclipsed 300 victories. Glavine’s other accolades include a World Series title in 1995, a World Series MVP trophy in that same year, and two NL Cy Young Awards (1991, 1998). The 2014 $1 Silver Baseball Hall of Fame coins are the first from the US Mint to feature a 3D design. 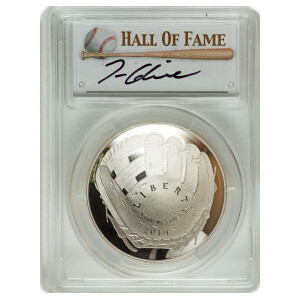 On the obverse side of the 2014 $1 Silver Baseball Hall of Fame coin is the image of a baseball glove. In the palm of the glove, there are three engravings that read “Liberty,” “In God We Trust,” and the year of minting. Don Everhart, a US Mint sculptor and engraver, designed the image on this side of the coin. The reverse side of the coin features the 3D image of a baseball that encompasses the entire face of the coin. Complete with the stitch marks commonly found on a baseball, this side of the coin has three engravings that read “United States of America,” “E Pluribus Unum,” and “One Dollar.” This proof coin is sold in packaging that includes Tom Glavine’s signature. Congress established the US Mint in 1792 with passage of the coinage act. 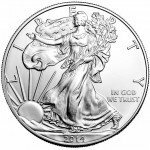 Today, the mint produces some of the finest bullion products in the world. The Professional Coin Grading Service has given this 2014 $1 Silver Baseball Hall of Fame coin a PR70 grade, meaning it is a perfectly minted proof coin. The DCAM label stands for “deep cameo,” which means the coin has deeply frosted images and letter that contrast with other fields on the coin. 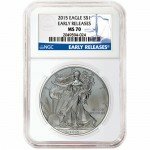 If you have any questions about this coin, or any other Silver.com product before placing your order, don’t hesitate to call our associates at 888-989-7223. You can also speak with us on the web by using our live chat feature.